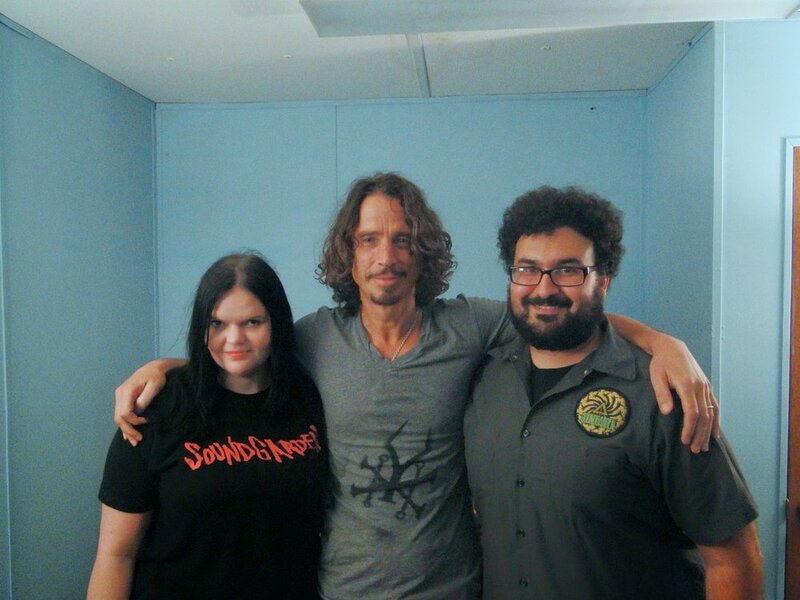 We had a chance to have a meet and greet with Chris Cornell before Soundgarden's set. We had just driven up to Tampa from the Soundgarden show in West Palm the previous night. This was our second time getting to see Chris backstage, and the first time in our home state. Little Chris and Toni were also there, running in and out of the room where they held the meet and greet. Our previous meet and greet was at an Austin Soundgarden show with one other couple. This was the first time where we would be alone with just Chris and, intermittently, the kids. Photofantasm wasn't complete yet so we printed out the would-be cover of the book, and made a homemade poster for Chris to sign. Chris: What do you got ? Meghan: You wanna see ? Meghan: Alright...So, a little homemade poster. Chris: How’ve you guys been ? Meghan: How ‘bout you ? 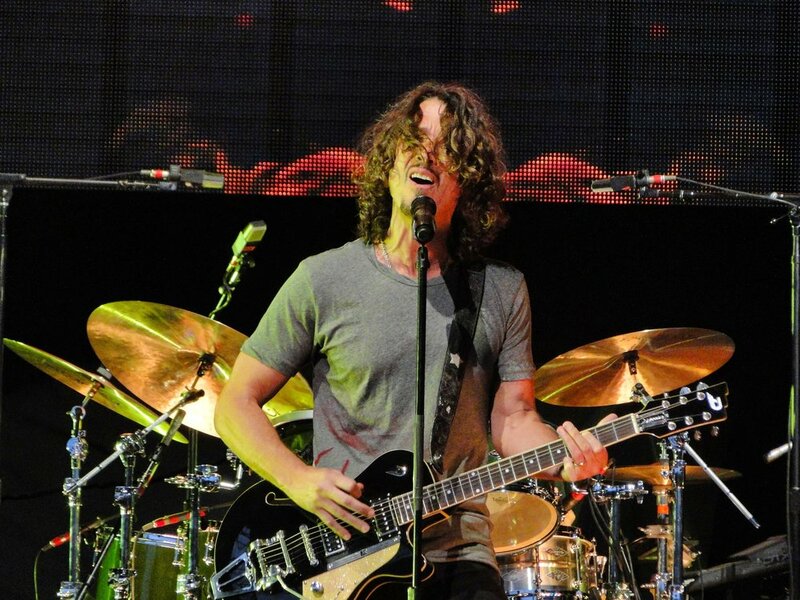 Meghan: We’ve seen Soundgarden like somewhere around 15 times and we live in Florida. Chris: Where’s the farthest you’ve gone ? Chris: (thinking about it) yeah, i guess, that makes sense, i guess. I was guessing a different country. Where, what part in Florida ? Chris: ...what else we doin ? Where’s your book ? Chris: uh huh, it’s not done yet ? Jeff: I don’t know if you remember Mike and Jaye...English ? Chris: Yeah...did I meet them ? Chris: Oh you do ? Chris: Which Songbook show ? Chris: Yeah, that was fun. Is that the only Songbook show you’ve gone to ? Meghan: What would you say was like your favorite place to play ? Chris: I dunno....I don’t think I have one, because what happens is you know you’ll have like this amazing experience at some venue, in some city, whatever it is. And um, you’ll go back, remembering how awesome it was and then it’s not the same, you know ? But then some other place, that you’re like...well, Toronto’s been really great...um, I don’t know if I thought that way of THIS show (NIN Tour) in Toronto just now that we just played, but the Songbook show in Toronto...the first one I did was amazing and I’d always talk about that. And then when I went back, I thought well, it’s not going to be as good as the first one, and it was like as good or even better. Places like...Austin, is always good. Chris: yeah. Austin is always good. Um....Seattle’s pretty good...not always, but I dunno, I think for me it’s always pretty good. Soundgarden is sort of...I dunno...it’s hard because it’s like hometown shows where everyone there has like four guests, you can’t really just relax, and enjoy the show. Texas, I haven’t played Songbook much through there, it’s like, Dallas has the House Of Blues, which I don’t do. I did it once, and I hated it. But like rock shows in Texas are always good.